Katafygio Studios are two luxury studios each accommodating 2 guests and having double bedroom, kitchen, breakfast bar, private bathroom and shared access to the individual terraces with views over the mountains and the beautifully peaceful bay of Assos. These fully refurbished (2017) studios are finished to the highest standard of style and comfort with air conditioning, luxury king size double beds with high quality mattresses,sleek modern kitchenette and separate bathroom. Katafygio Studios enjoy a private location on a quiet village lane and yet offer breathtaking views and only a 2 min walk to the village, tavernas and beach. Assos is the perfect place to relax and unwind but we would highly recommend renting a car if you plan to do a little exploring. We fell in love with the Greek Islands many years ago whilst backpacking. A sailing holiday some years later only added to the feeling.Now that both our boys are living and working in London we returned to Greece and discovered the jewel of Kefalonia - the village of Assos! Just 4 years later we found this amazing house for sale so we snapped it up and set our plans in motion. We will be spending most of 2017 on the refurbishment project which will produce two brand new luxurious studios ready for the 2018 season. We will be in Assos for the whole of the season to welcome and look after our guests and we plan to build a happy, satisfied customer base and hopefully make many new friends along the way. Having lived and worked in the West Midlands all our lives we recently bought a cottage in Colwall village in the beautiful Malvern Hills in Herefordshire and will be spending our winters there. We fell for the property straight away because it offers everything the discerning holidaymaker needs for a chilled, relaxing time. It is set in an elevated position on a quiet little lane with fabulous views of the bay and mountains and the Venetian fort. The beach is no more than 2 mins walk and for convenience the local mini market is only 1 min walk! It's perfect. Total relaxation! A fantastic place. These studios are lovely; they have everything you could want and Dot & Steve (the Owners) were extremely helpful. They have thought of everything. The home from home touches and decor are wonderful. Spotlessly clean and the views are stunning. Thanks for a great week. We really appreciate you taking the time to post a review - it was lovely to meet you and Kevin. A little gem in a perfect location! Dot and Steve have thought of everything to make your stay as comfortable as possible. The studio is exactly as the photos shows, fresh and contemporary with the most comfortable bed. Assos is beautiful and in a perfect location. If you’re thinking of staying there next year book now so you’re not disappointed! Glad you enjoyed your stay and thank you for the lovely review. You're welcome back any time. We loved our stay at Katafygio. The studio was spotless, well equipped and really homely. The stylish touches around the studio really added to the stay. Dot & Steve manage to be both welcoming hosts and unobtrusive at the same time. All in all a memorable stay. Lovely of you to post a review - the booking rate has really accelerated for next season. Steve and for were brilliant hosts showing us around the area and always on tap if needed. Assos is the most beautiful village and we are naming to visit next year with all the family. Thank you Christine we are so happy you enjoyed your stay and our warmest congratulations to you both for your forthcoming nuptials - we have to agree that a sunset over Assos is a perfect place for a proposal! ASOS is an absolute gem,a dream really somewhere that you hope to find but doubt that you will.The journey there is amazing in itself and the village is quiet but has enough restaurants and bars to keep you satisfied.the bay is not tidal so very safe and the water is so warm.I cannot praise our studio apartment enough again it is everything that you could wish for,spotless ,comfortable,stylish with so many personal touches and the owners are such lovely people.GO.you will not be disappointed. Hi David and many thanks for your review, it really helps us. Dot and I are glad you enjoyed your 'christening' celebrations and also the Festival in the village on your last night! We hope to see you in Assos in the future. A wonderful property with super hosts in a spectacular setting!! Steve and Dot were tremendous hosts, nothing was too much trouble. 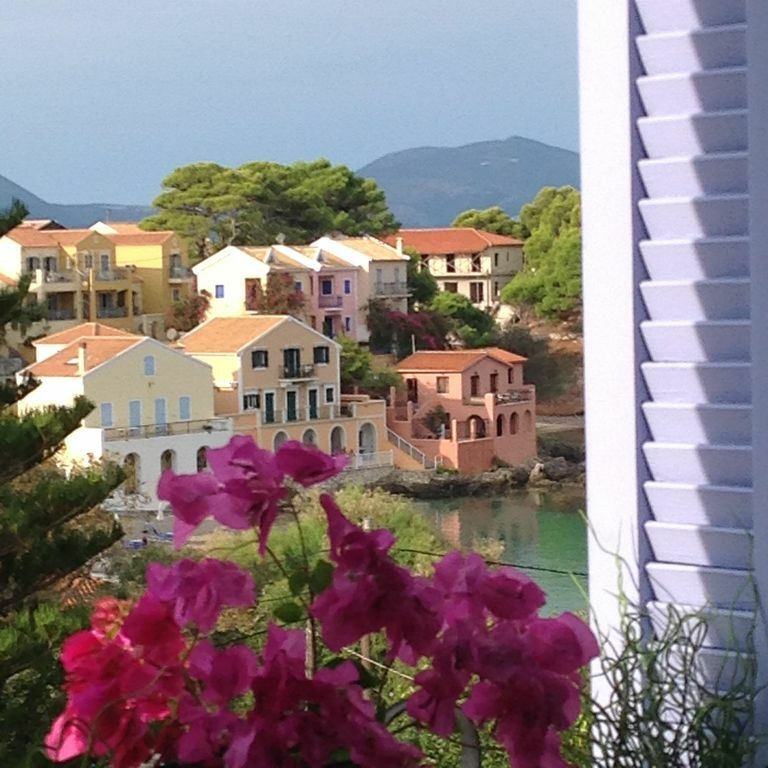 The studio was beautifully presented with outstanding views over Assos Bay. Every thing we needed and more was present to make our stay special with so many classy little touches. Assos is a beautiful location. People are friendly. We had a lovely relaxing stay and didn't want to leave. Hi Pete and Karen, many thanks for your comments it really helps instil confidence for securing future bookings - thank you. It was a pleasure to have you and hope to see you again.